The pertinent question is ..??? “Twenty years ago, if someone had said, you would be painting Allah’s divine names in future, I would find it hard to believe for three reasons. 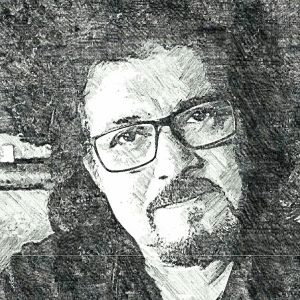 Second, I was living in New Delhi and running an advertising agency which routinely employed the creative artists, but only for creating the commercial advertising for television and print media. My only connection with painting was my friendship with some very well known painters, and occasional visits to much sought after events, whenever possible. Third, the chore of mixing the paints and cleaning the brushes seemed out of sync with my habits and experience. “The Ramadan inspired LED show that Noor designed and produced for Burj Khalifa depicting the divine names, was chosen to be played on the façade of the world’s tallest tower many times in the evening. A combination of artistic interpretation coupled with a spiritual concept, this show is being received with overwhelming response by both live and online audience. The Asma Exhibition at Dubai Mall Opened in sync with the LED Show at the Burj Khalifa, 1st of Ramadan 2018. 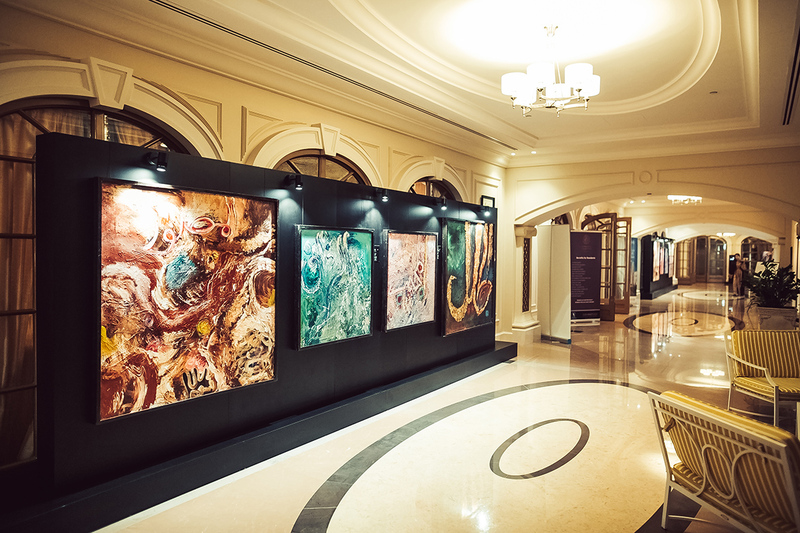 Consisting of a hundred canvases, it set new benchmarks of elegance in exhibiting art at public places. 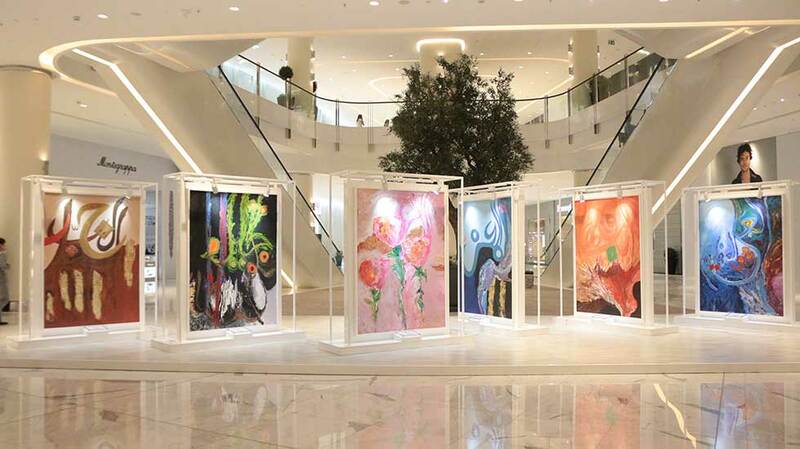 Spread over two floors over thousands of square feet of space, at the newly opened Fashion Avenue, it transformed Dubai Mall into a hottest art destination during the whole month. 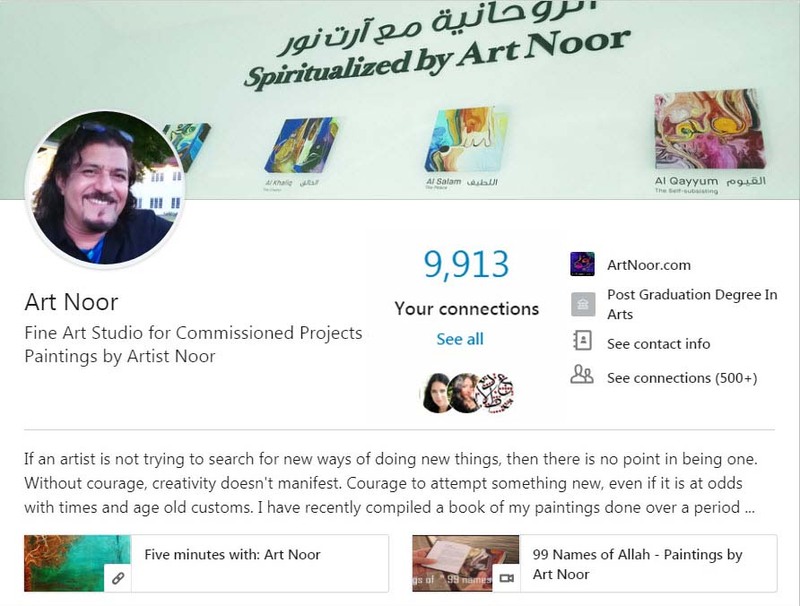 In 2006, Noor set up a studio for doing his art, at distance of twenty kilometers from the city. It didn’t seem the best location to begin with. But it turned out to be blessing in disguise. How ?? A program was orchestered to celebrate the arts, poetry and local music in the auditorium. In harmony with gentle morning and the multicultural spirit of Dubai. it soothed the senses and conveyed the powerful message of peace and progress through tolerance. The event concluded on a yummy and elegantly laid out 'brunch' with lovely white roses on white table cloth - overlooking the Mamzar corniche. Rumi said "My soul is from elsewhere. I am sure of that. And I will land up there"
Gina was a beautiful soul who inhabited this earth till a day before yesterday. On her journey now, she will be happy with your prayer. Deeply involved with the art scene in Dubai, she curated my solo exhibition 'Fragrance of Faith' at St Regis in 2017, with uncommon enthusiasm and energy. She leaves behind family and friends who loved and cherished her. May they have the strength to bear this loss. Wishing A Blessed and Happy Eid❤️🎈💐!! Hers's a brief chronicle of my few days in the last week of July in the breathtakingly beautiful valley of Kashmir called Srinagar. Located at the crown of India's geography, It has been through a lot of trouble due to militancy, during the last two decades, while being being stuck amidst the two arch rivals--India & Pakistan. It is home to many unique gardens created by the Mughals, a grand palace which is a hotel now, and the magnicient Dal Lake, with hundreds of 'house boats' rented out as hotel accommodation. Art Noor's ASMA at the Dubai Mall ends tomorrow. You can visit today or tomorrow. The Mall is open till 2 PM. You can also collect a commentary copy of the 99 book from any information desk at Dubai Mall. Al Fattah - The Opener. Acrylic on canvas, painting by Art Noor, 190cmx140cm on display at ASMA - the exhibition of paintings of 99 Nanes of Allah at The Dubai Mall. AL Baqi - The Everlasting. Acrylic on canvas, painting by Art Noor size 190cmx140cm, on display at ASMA - the exhibition of paintings of '99 Nanes of Allah' at The Dubai Mall. A few days are left for the #Ramadan inspired LED show “The 99 Names of Allah” by @art_noor on #BurjKhalifa. Catch it every night starting at 7:45 pm onwards.